What can i achieve from this surgery? Blepharoplasty can correct loose, sagging, fatty skin from the lower & upper eyelid including drooping hooded eyelids, all of which add years & at times impairs vision. 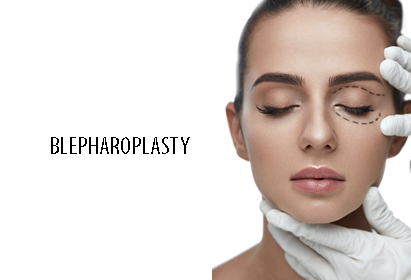 What is the procedure of Blepharoplasty? General anaesthesia or intravenous sedation is administered after which incisions are made to remove excess fat & skin. The procedure is carried out with skill & expertise in order to avoid scarring. How long does it take to recover from an eyelid surgery? It is common to have bruising & swelling after the surgery. Your eyelids should look normal with a week or two at most. Upper eyelid surgery can last at least five to seven years. Lower eyelid surgery rarely needs to be repeated.